I wanted to blog about this after Chinese New Year, but I assumed it will be something everyone has seen so I didn’t. 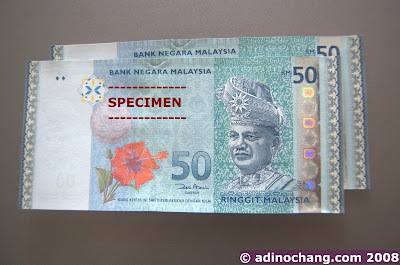 But until today, I haven’t seen any new Malaysian Fifty Ringgit currency notes in circulation. Does anyone have any idea why it’s not being used at all? 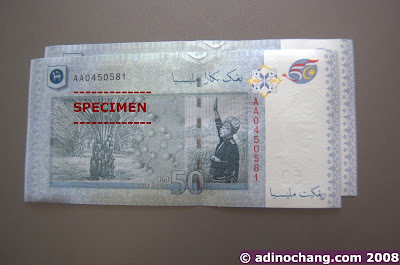 Is everyone just keeping the newly minted RM50 dollars at home? If you haven’t seen them yet, I took some photos to share with you. This picture below is a front view. In case you are wondering why that lovely, alluring, silver background looks so familiar, it’s because I used Izzie as a backdrop. The following is the back view. The semi-circular crease at the middle top part is not part of the design. I think I clipped it with something. 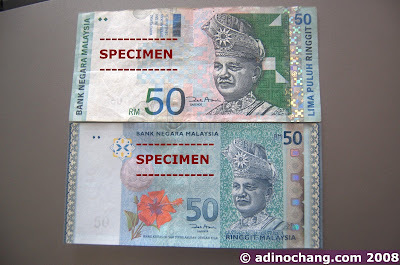 Comparison between the existing and new 50 ringgit notes. The size is the same but the dark border on the new note makes it look smaller. ATM machines don’t accept them yet, so I feel like it’s still semi-legal tender. 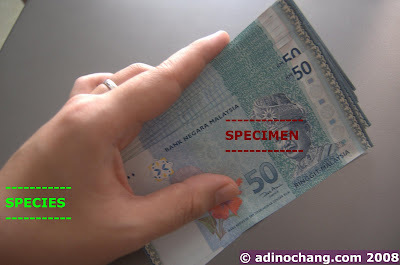 By the way, how come there has to be ‘Specimen‘ or ‘Contoh’ whenever money is being displayed in print media? I don’t know the exact reason but I thought I’d better do the same here. I got a whole stack of them but tak sampai hati (can’t-reach-my-heart) to use them. They look so nice together. no mah..she wanted…and so ngam i got extra so mah change with her..